DUBAI, 9th November, 2018 (WAM) -- Mohammed Ahmed bin Abdul Aziz Al Shehhi, Undersecretary for Economic Affairs in the Ministry of Economy, has discussed with Viljar Lubi Deputy Secretary-General for Economic Development at the Estonian Ministry of Economic Affairs and Communications, means of boosting economic relations between the two countries. During the meeting, which took place at the headquarters of the Ministry of Economy in Dubai, the two sides reviewed ways to further develop trade and investment cooperation and exchanging expertise in various economic fields of common interest, especially modern technology, information and communication technology. The meeting also touched on the possibility of developing channels of partnership in a number of priority sectors in the future development agenda of the two countries, including advanced industries, clean and renewable energy, civil aviation, logistics, education, health care and tourism. 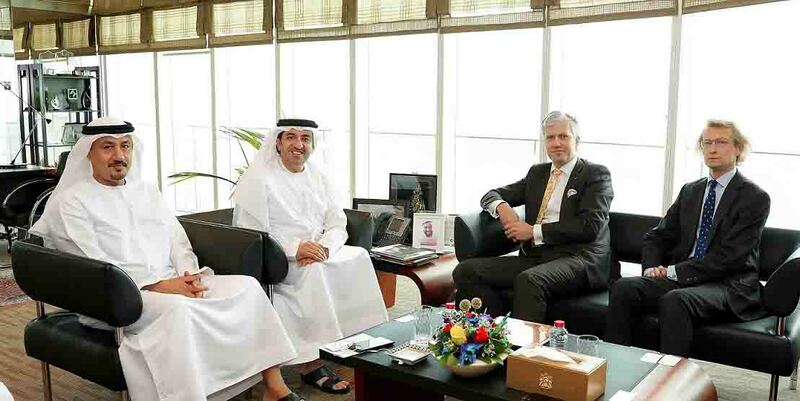 Al Shehhi briefed the Estonian official on the future developments of the investment climate in the country, especially after the issuance of the new Foreign Direct Investment Law, which is considered a qualitative leap in attracting trade and economic partnerships to the UAE, including investment companies and business community in Estonia. For his part, the Estonian official highlighted his country's interest in strengthening economic relations with the UAE, developing trade and investment cooperation frameworks and enhancing the presence of Estonian companies in the UAE's markets.